Thanks to you, Denny (NMC '14, '17) flourished at NMC.As a “Big Brother” for Big Brother Big Sisters of Northwestern Michigan, Denny Nguyen (NMC ’14, ’17) visits his mentee Sam once a week. It wasn’t long into their first mentoring session that Denny saw his younger self reflected in Sam. When Denny was Sam’s age, he was shy. He stayed that way as he got older, mostly keeping to himself at Traverse City West Senior High. When he enrolled at NMC, Denny decided to make a change. 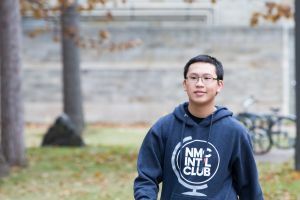 He made a promise to himself to get involved on campus, to be part of something, and to meet new people. Thanks to you, Denny could keep his promise. Because of your generous support, NMC can provide students extracurricular activities, dormitory living, and access to cultural programming like the Dennos Museum Center, WNMC radio, and the International Affairs forum. Denny took advantage of these offerings. He joined multiple student groups and participated in all the campus events and activities he could. He took leadership roles in the International Club and met students from Mexico, Afghanistan, and India. He enjoyed meeting new people and learning about their lives. And, he enjoyed sharing his Vietnamese background with his new friends. Denny’s parents emigrated from Vietnam and now own a nail salon in Traverse City. Denny was busy earning two associate degrees, one in liberal arts and one in accounting, but he still made time to become a Big Brother to Sam. In the two years since their first mentoring session, Denny has worked with Sam to open up and branch out. Denny feels good that when their mentoring relationship comes to a close next year, Sam will be moving on with an openness and appreciation for new experiences and people; the very thing Denny found at NMC.